Back again for Day 2 of the Group Posts for the June Release of Papertrey Ink. We've got a fun one today with "Round Repeats". This is a stamp set that just begs to be fiddled around with. You know what I'm talking about...you, the stamp set, a piece of scratch paper, and a couple of ink pads. That's is exactly what I did when it came to creating these projects. And I like to think I got some pretty good results. So if you are looking for an elegant set that will let your imagination and creativity run wild, I think this is the one for you. How about this elegant little number? We were challenged by Nichole to us the individual builder pieces in a non-traditional way. I came up with this arrow pattern by repeatedly stamping this one particular stamp. The centers got adorned with Blueberry Sky Buttons. And to further emphasize the arrow shape, I placed two Vintage Cream triangles on the bottom corners. "Sew Simple Borders" was stamped in Dark Chocolate Ink for more definition. With the resulting white space on the top half of the card, I placed the Boutique Borders: Mother frame die cut and stamped with this month's new Boutique Borders: Thanks in Fresh Snow. I really like this unique card. It's got some class and a touch of the unexpected. Next up, something bolder in a background pattern. Again, I was just fooling around, trying to build a background with the medallion builders. I found that in creating a background, you alternate rows between full medallions and half medallions. I stamped Ocean Tides ink on Aqua Mist cardstock. Highlights were added with a Prismacolor white pencil. For my sentiment, I selectively inked a sentiment from "Side by Side Sentiments" and split it up between two Double Ended Banner cuts. That's it for me today. I'm looking forward to seeing what the rest of the girls came up with using this fabulous set. Remember, "Round Repeats" and the rest of the June Papertrey Ink goodies are available for purchase on June 15th. Just one more day! Your second card has a dynamite layout! It is so straight forward, and so stylish at the same time. 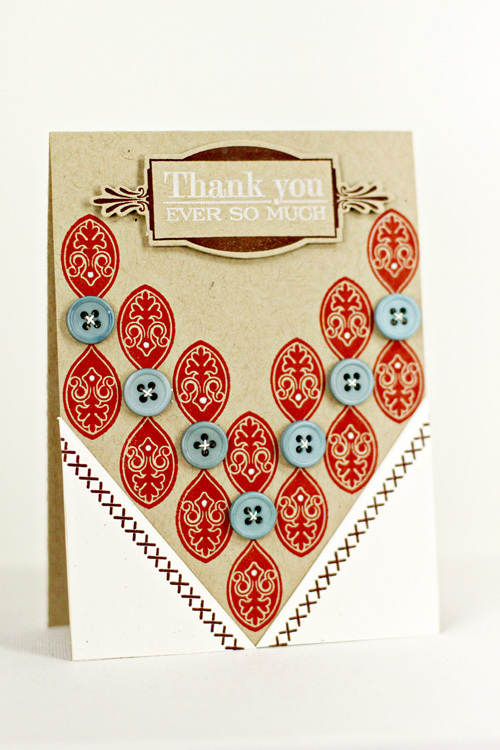 I love that you used the white pencil to add a little variation to the repeats, and how you nested your pattern. You are a creative wiz! Love your first card! It is a new look, well designed in layout and colors, just the right embellishments, and perfect for either gender! Oh Erin, you get the Top Prize for most creative card (IMO ;) Your first card is so creative and strikingly beautiful! As always, nice work! I love how your first card takes on a western look and the use of a white pencil on the second one. Both are pretty. Pretty good results? How about stunning results? Gorgeous, and I can't wait to work with this set. I really love the first card and how you incorporated the buttons. That is so cool. I can't wait to get this set. I hope you have a lot of them because they're going to go like crazy. Amazing!!!! I really like the repeat pattern with the buttons in your first card. The colors are really complimentary. Lovely! Go Dani! Want a skirt that looks like the first card. And a beach coverup like the second. Can you tell I love these cards? Just clever greatness today! Oops! I meant Erin :) Too many great projects to digest! Very pretty cards! 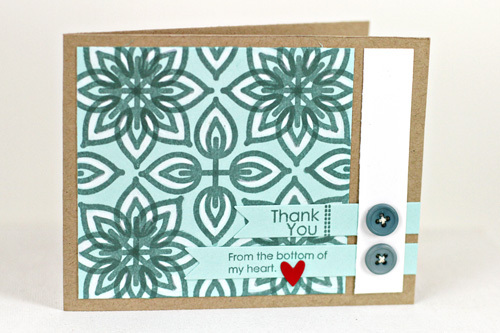 Really like the button embellishments on the first card - very creative. You mean the first one wasn't intended to look like a statement necklace paired with a v-neck shirt? (Cause that's totally what I see!) Love both of these, Erin! Love the red card! So gorgeous! We all have our ideas, but my initial thought when I viewed your first card was a beautiful necklace and a v-neck top. And then I read your detailed description. That just shows the possibilities are endless with this beauty. Think this stamp set will be a best-seller. Awesome cards, Erin! Hi Erin, lovely cards today. I'm chiming in on the fashion debate to say that I saw a boho/peasant top with the first card! A lovely colour scheme and very pretty and unusual card.